I don't get why very few of my Chinese friends like Mexican food. I guess that's because they can't stand the taste of the sauces? 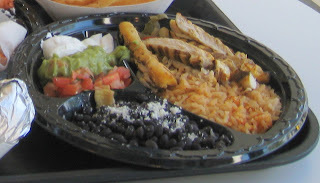 I really do love it though and one restaurant that I often get my Mexican food craving fixed is Baja Fresh. Among all the salsas that Baja Fresh provides, I love their tomato salsa the most (the one at the far left).